The Builders Association of Northern Nevada (BANN) in partnership with Paradiso Communities launch the Dream Home Fall Family Fest on Saturday, Oct. 21 from 2-5 p.m. as the official kick-off of the Dream Home Raffle. 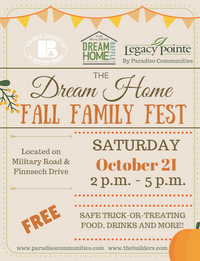 Family members of all ages are welcome to the free Dream Home Fall Family Fest with safe trick-or-treating, food, drinks and more. Attendees will be able to experience the autumn spirit as they enter a picturesque festival filled with interactive games and photo opportunities.